HCM Centre of Excellence, a new service dedicated to delivering the industry's best research, insight, and intelligence to the HCM community. Some great content is already available. 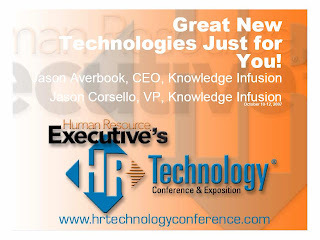 I particularly recommend their presentation from the HR Technology conference, ‘Great New Technologies Just for You’. Collaboration is also a key focus of the centre, and you can now find my first contributions there at www.knowledgeinfusion.com/coe. Thanks for sharing with your audience and joining the conversation. More great stuff is in the works.